Four premium quality springs and two bearing grade thrust washers are used in place of the poor quality stock components. 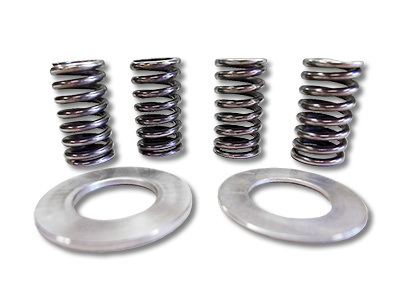 LG clutch springs are made from superior spring steel chosen for its resistance to fatigue and heat related deterioration. Also utilized are a set of bearing grade hardened steel thrust washers which are 30% harder than stock. They provide smooth clutch engagement, especially when hot, and an extended service life. Here is the LG inner hub spacer plate all by itself on the clutch basket. 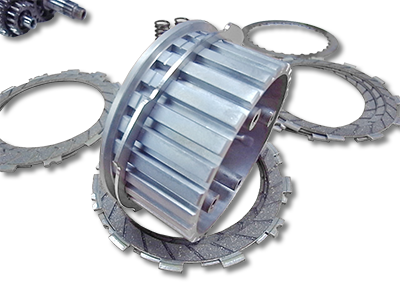 The Inner Hub Spacer Plate replaces the stock Belleville washer and seat, increasing clutch disengagement and eliminating drag.Here is the LG inner hub spacer plate all by itself on the clutch basket. The Inner Hub Spacer Plate replaces the stock Belleville washer and seat, increasing clutch disengagement and eliminating drag. 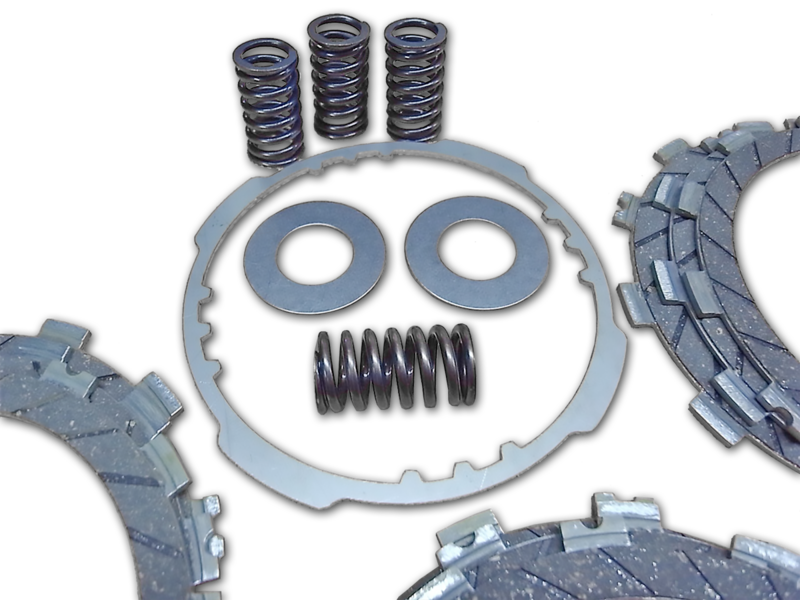 Here is the LG exclusive clutch Belleville-type "spacer" replacement. 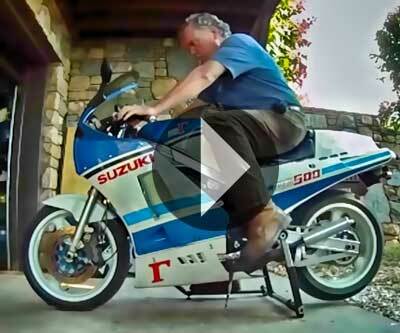 It goes between the clutch basket and the first metal plate. The solid spacer is the thickness of the stock Belleville-type when it is fully compressed. 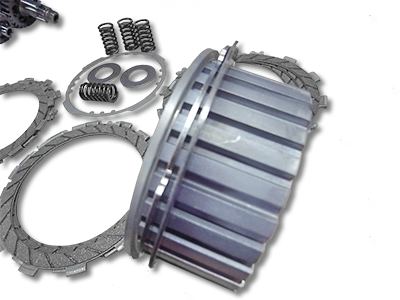 Since the LG clutch spacer is a solid part it remains the same thickness at all times. 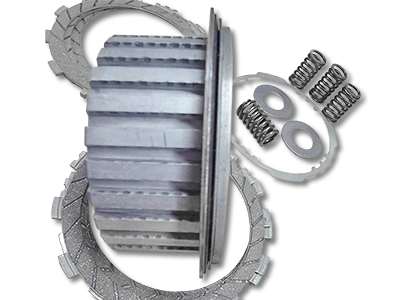 This results in the clutch plates separating more completely from each other when the clutch lever is pulled. For comparison purposes here is the stock setup. 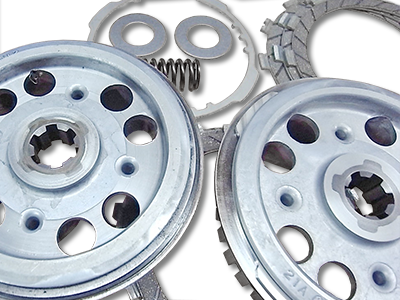 The stock Belleville-type "spacer" is between the clutch basket and the first metal plate. When the clutch lever is pulled the stock part flexes back and pushes the clutch plates into each other instead of allowing them to separate easily. If you would like to have your clutch work like mine, feel free to contact me for more details.